Music legend Steve Miller has produced and personally directed the curation and creative process for two new, career-spanning Steve Miller Band Ultimate Hits collections, to be released September 15 by Capitol/UMe. 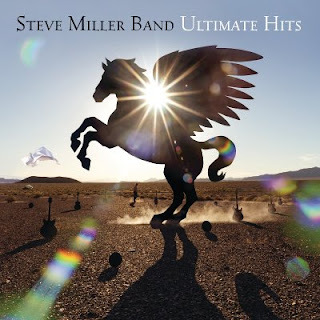 Ultimate Hits is available now for preorder in a 1CD and digital edition featuring 22 essential Steve Miller Band tracks, including three previously unreleased rarities, and in an expanded 2CD and digital deluxe edition with 40 tracks, including the acclaimed band's top hits, live tracks, and eight previously unreleased recordings from the studio and the stage. On October 27, both editions will be released on 180-gram vinyl in 2LP and 4LP deluxe packages. Both Ultimate Hits editions feature Steve Miller Band's biggest worldwide chart-toppers, including "Take The Money And Run," "Rock'n Me," "Jet Airliner," "The Joker," "Abracadabra," "Jungle Love," and "Fly Like An Eagle." The 1CD and digital edition adds two previously unreleased live recordings, "Living In The USA" and "Space Cowboy," as well as a never-before-released Steve Miller solo recording of "Seasons." The 2CD and digital deluxe edition also features those rarities, plus five more previously unreleased studio and live recordings, including a demo for "Take The Money And Run." Ultimate Hits' stunning cover art was designed and photographed by StormStudios in collaboration with Miller. It was recently announced that Steve Miller has brought his entire catalog of recorded music to Capitol, where he originally began his recording career in 1967. Miller has opened his vault/warehouse of music, footage, photos, memorabilia, artwork, handwritten notes, journals, and more to Capitol/UMe to include in his upcoming releases. Steve Miller Band's new Ultimate Hits collections, produced by Miller, launch the initiative. One of the world's most commercially successful and acclaimed artist/bands in the history of popular music, Steve Miller was a mainstay of the San Francisco music scene that upended American culture in the late '60s. The Steve Miller Band released two LPs on Capitol Records in 1968: Children of the Future, and Sailor,which included "Living In The USA," which became a staple on the new rock radio format. Next came Brave New World, the band's third album including the hit "Space Cowboy," and "My Dark Hour," which Miller recorded in London with fellow label-mate, Paul McCartney, who is credited as Paul Ramon. After the band's next few albums, Your Saving Grace (1969), Rock Love (1971), Recall The Beginning (1972), and Number 5 (1970), Miller made some changes to the band, went to Los Angeles and produced his own record in 19 days. That album was The Joker. The title track became a Number One worldwide smash hit. Miller had crafted a brand of pure pop that was polished, exciting and irresistible that dominated radio in a way that few artists have ever managed. His next two albums, Fly Like an Eagle (1976) and Book of Dreams (1977), both went multiplatinum, and the hits they generated are among the most recognizable songs in pop music history. Hit followed hit in what seemed like an endless flow: "Take The Money And Run," "Rock'n Me," "Fly Like An Eagle," "Jet Airliner," "Jungle Love," and "Swingtown," to name a few. In 1978, Capitol released Greatest Hits 1974–78, which has sold more than 17 million copies worldwide. Miller's had a worldwide hit with "Abracadabra," the title track of his 1982 album and in 1986, a #1 Billboard Rock Album Track with "I Want To Make The World Turn Around." To this day, his songs are instantly recognizable when they come on the radio. Their hooks are the very definition of indelible. In recent years, Miller has immersed himself in the blues once again. And, as always, whether he was riding the top of the charts or exploring the blue highways of American music, he is playing and singing with conviction and precision, passion and eloquence. At this stage of his life, in 2017, Miller feels more fulfilled than ever. He recently moved to New York, where he is on the Board of Jazz at Lincoln Center and on the Board of the Metropolitan Museum of Art's Musical Instrument Department. And, of course, he continues to record and is currently on tour.